Old Trafford, Manchester - Manchester United Blog: How much of a difference has Paul Scholes made? For many, United's re-signing of Paul Scholes last month was a blatant act of desperation and clear evidence that the reds could no longer attract the top talent or compete at the higher end of the transfer market. Some portrayed Scholes' return as a slap in the face for the reds' emerging youngsters; a signal that they could not be trusted; that an ageing veteran had to be summoned instead. Others took it as Fergie's overdue admission that his midfield was not up to scratch. As for United fans, most were delighted to see a legend return but, privately at least, some had their doubts; even if they would not have admitted it. Indeed early in his comeback, the 3rd round FA cup tie against City, those doubts seemed well founded when his stray pass resulted in a goal for Sergio Aguero at Wastelands. A week later, Scholes scored against Bolton but seemed off the pace at times. But how has it gone since then? Scholes has played 391 minutes out of a possible 540 since he returned; which is the equivalent of 4.34 matches played out of 6. In that time he has scored 2 goals, taken 7 shots, completed 2243 passes, made 11 tackles (9 successful) and been booked once. But how much of a difference has he made? 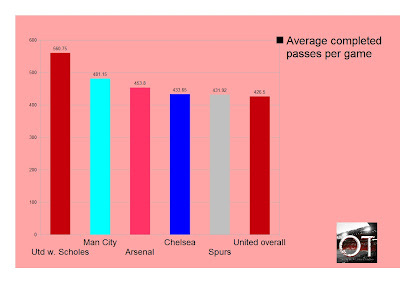 In a previous article we saw that United had completed fewer passes than any of their top five rivals (and Swansea), averaging just over 426 per game. Incredibly, with Scholes in the side United average 560, or 31.45% more. Individually, Scholes' own figures are astonishing too, considering he was retired just over a month ago. The next graph shows the top passers from the leading three clubs, United, City and Spurs. In an article last week we saw that of the players to have played 15 games or more, Yaya Toure was out in front in terms of competed passses, but Scholes exceeds him significantly. 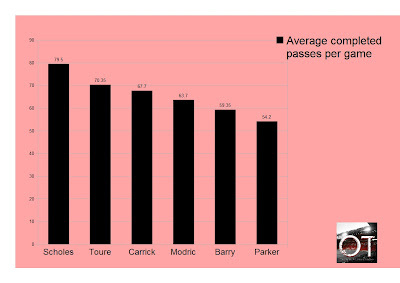 Indeed, the United man is well in front on a whopping 79.5 competed passes per game, with Micheal Carrick in third place. 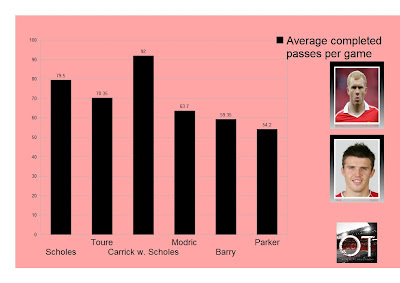 Furthermore, if we examine Carrick's figures in the games he has played alongside Scholes we see the following. It is emphatic; Carrick is miles ahead of the field on an average of 92 passes per game when paired with Scholes. 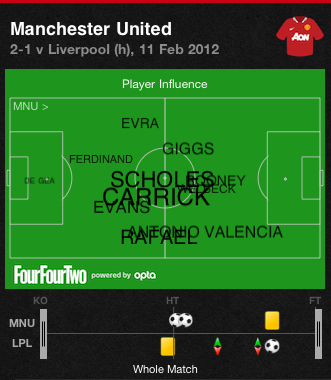 The following 'player influence' charts show the dominance the Carrick/Scholes partnership has asserted over opponents. In all three matches, the experienced pair maintained their positions perfectly in the centre of the pitch, with Carrick keeping more to the right and playing slightly more defensive, while Scholes operates to the left in a marginally more advanced position. We also see that over the three games, the two central midfield men were dominant in the middle, moving the ball around nicely, keeping the play flowing. Of course it is early days yet but it is clear that since his return, Paul Scholes has made a major impact on United's midfield. Over the past month and a half he has been a key influence in helping to restore control and finesse in the centre of the park. While it is also possible to make too much of the short term effect his return has had, it would be foolish to dismiss it too. Scholes has faced some top opposition over the past few weeks; playing his part against City, Liverpool (twice), Arsenal and Chelsea as well as a tough away test at Norwich. He has rarely looked troubled. In Michael Carrick, he has found the perfect partner. The pair have rekindled the stylish partnership which won the title in 2006/07 and have helped keep the reds in the title charge this term too; shepherding the team through some difficult fixtures. Of course, there is no telling how the rest of the season will go for Scholes. It must be remembered that he is 37 years old and as recently as last season he felt as though his legs had 'gone' but even so, it would be no surprise if he did manage to continue his good form for the rest of this term; and then who knows? Maybe we will see him again next season. Lets hope.